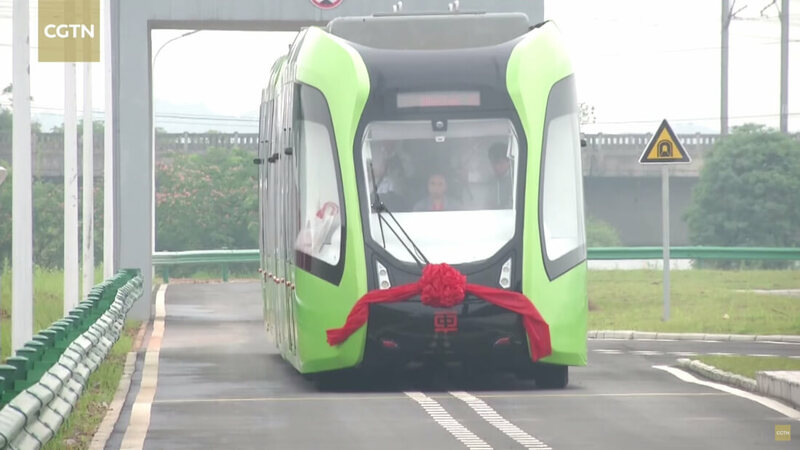 China unveils electric road train that runs on painted "tracks"
Chinese railcar-maker CRRC is referring to this mode of public transportation as a “smart bus.” Unlike the straddling bus, the Autonomous Rail Transit (ART) doesn’t require tracks that are embedded into the ground. Running on rubber wheels, the vehicle follows a preset path using sensors that keep it over the white-dotted lines painted on the road. The carriage doesn’t even need a driver but, as with self-driving cars, the video shows one behind the wheel, presumably to take control if the need arises. At 105-feet long and over 11-feet tall, this electric bus/train can reach 43.5 mph and carry 307 passengers, though more sections can be added to increase capacity. Moreover, it can travel 25 kilometers (15.5 miles) after just 10 minutes of charging. Unlike subway trains, which cost around $58 million to $102 million to build every kilometer of track, the low-impact infrastructure of the ART means it costs around $2 million per kilometer. The first ART line will be 6.5 km (approx. 4 miles) long and is set to launch in Zhuzhou sometime next year. When finished, it will be able to dock with the city’s mid-low speed maglev train.